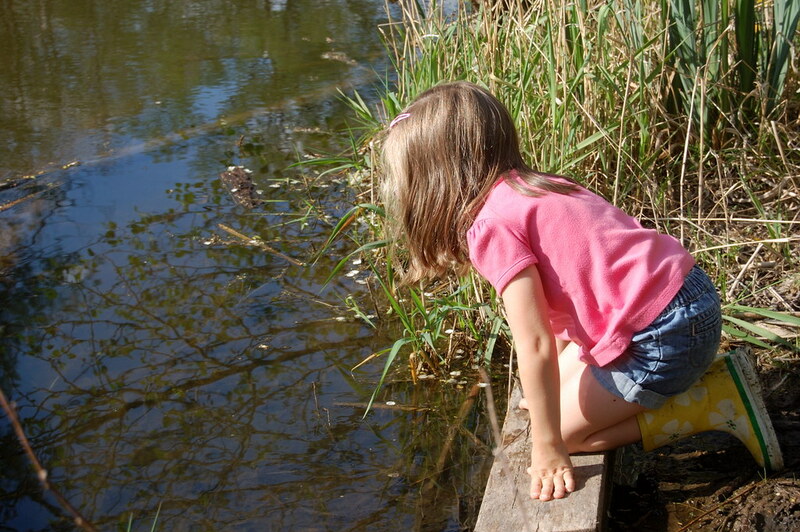 hunting for tadpoles is an important part of a balanced childhood. So the first thing you need to learn about Nature Deficit Disorder is that it’s not real, but, like Ann Douglas‘s Maternal Distraction Disorder, it should be. The effects are real. The cause is real. But the diagnosis and all of the potentially expensive pharmaceutical treatments are not real. It is Richard Louv’s attempt to turn our typical thinking about the health effects of non-human nature on its head. All too often we think and act as if the baseline, default state of humanity is to live on concrete islands which we need to expend considerable financial and physical effort to leave in order to have contact with some mythical and highly idealized Nature that brings us above ourselves, elevates us. Whereas, in truth, our baseline and default state is to live in continual contact with non-human nature, and our concrete islands debase us, rob us of physical and emotional health, stunt our thinking, exhaust our spirits, and rob us of peace. It isn’t that being in nature makes us healthy. It’s that being OUT of nature makes us SICK. Hence–Nature Deficit Disorder, or what happens to people when they grow up with asphalt and rubber and html and jingles instead of wood and stone and stories and birdcalls. It ain’t pretty. Yet we keep choosing the concrete islands. They make us physically, emotionally and psychologically ill, and yet we cling to them as if a little bit of mud is the real threat. A mosquito bite. Non-human nature isn’t a luxury or an add-on, like a nice pair of shoes or a new TV. It’s more like Vitamin C. You can try to live without it but don’t come to me for sympathy when your gums start bleeding. It doesn’t take much. Even an urban viewscape including trees or a houseplant indoors will make a difference. You can improve your attention, your focus, your mood, your recovery from illness, your fitness level, your ethics and your decision-making ability all by remaining connected to non-human nature. It’s cheap: no one has yet figured out a way to market the sight of trees on a busy street or put a garden in a bottle. It hasn’t yet been licensed or copyrighted or patented. According to one recent meta-analysis it takes as little as five minutes–five minutes!–to be outside and active for long enough to make a cognitive and emotional difference. Five minutes. That’s barely longer than it takes to buy a coffee, and you’ll get more from it. And it’s free. And there’s nothing to stop you from buying the coffee and taking it with you. There; I have officially eliminated all of your excuses. Most importantly, for the parents among you, outdoor activity had especially strong effects on children. Kids need to play outside.